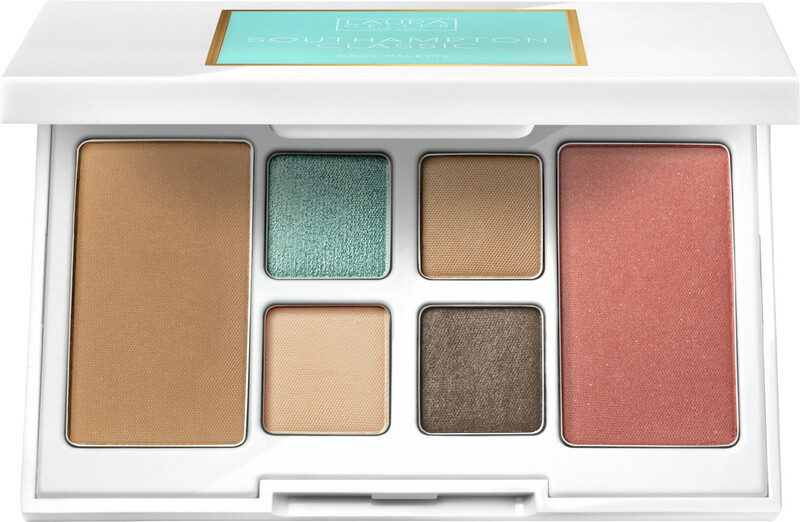 Create radiant summer makeup looks with ease thanks to the Laura Geller Southampton Classic Face Palette. Inspired by summer light, the Southampton Classic Face Palette will help you to achieve a sunkissed makeup result in a few easy steps. With a harmony of 4 radiant eyeshadows, a romantic coral blush and a beautiful golden bronzer at your fingertips, your summer look promises to be radiantly and eye-catching. Laura Geller Eyeshadows 4 x 0.8g Sand Dollar, Sea Glass, Dune Road & Driftwood: With a mixture of soft mattes and high-pigment satin shades, this summer-inspired palette will create a radiant and sun-kissed eye look. Laura Geller Blush 5g Coral Reef: The pinky coral hue of Coral Reef will give the cheeks a healthy and flushed glow. Laura Geller Bronzer 6.2g Vitamin Sea: Perfect for adding warmth to the complexion, this medium bronzer has a neutral undertone that will define and enhance the features. Laura Geller Blush (Coral Reef): TALC, MICA, CAPRYLIC/CAPRIC TRIGLYCERIDE, CALCIUM SODIUM BOROSILICATE, DIMETHICONOL STEARATE, MAGNESIUM MYRISTATE, DIMETHICONE, TRIMETHYLSILOXYSILICATE, CAPRYLYL GLYCOL, HEXYLENE GLYCOL, PHENOXYETHANOL, TIN OXIDE, ALUMINUM HYDROXIDE. MAY CONTAIN +/-: CI 77891 (TITANIUM DIOXIDE), CI 77491/77492/77499 (IRON OXIDES), CI 15850 (CI RED 7 LAKE), CI 19140 (YELLOW 5 LAKE), CI 42090 (BLUE 1 LAKE). Laura Geller Eyeshadow (Driftwood): TALC, MICA, DIMETHICONE, OCTYLDODECYL STEAROYL STEARATE, SYNTHETIC FLUORPHLOGOPITE, ZINC STEARATE, POLYBUTENE, CAPRYLYL GLYCOL, HEXYLENE GLYCOL, GLYCERYL STEARATE, TOCOPHEROL, LECITHIN, ASCORBYL PALMITATE, GLYCERYL OLEATE, PHENOXYETHANOL, CITRIC ACID, TIN OXIDE, CI 77891 (TITANIUM DIOXIDE), CI 77491/77492/77499 (IRON OXIDES). Laura Geller Eyeshadow (Sea Glass): MICA, OCTYLDODECYL STEAROYL STEARATE, TALC, PENTAERYTHRITYL TETRAISOSTEARATE, CAPRYLYL GLYCOL, HEXYLENE GLYCOL, MAGNESIUM MYRISTATE, PHENOXYETHANOL, TIN OXIDE. MAY CONTAIN +/-: CI 77891 (TITANIUM DIOXIDE), CI 77491/77492/77499 (IRON OXIDES), CI 77510 (FERRIC FERROCYANIDE). Laura Geller Eyeshadow (Sand Dollar, Dune Road): TALC, MICA, DIMETHICONOL STEARATE, DIMETHICONE, DIISOSTEARYL MALATE, OCTYLDODECYL STEAROYL STEARATE, CAPRYLYL GLYCOL, LAUROYL LYSINE, PHENOXYETHANOL, ZINC STEARATE, HEXYLENE GLYCOL. MAY CONTAIN +/-: CI 75470 (CARMINE), CI 77491/77492/77499 (IRON OXIDES).